In Baptism, we become adopted children of God! We are made part of Christ’s Body, the Church, and are freed from sin. This first sacrament of Christian initiation opens the door to the other sacraments. Jesus opens the door to the Kingdom of God to all who are baptized in water, and in the Holy Spirit. Our Infant Baptism workshop helps prepare parents and sponsors for the wonderful Rite of Baptism, and the important ongoing commitment to faith formation of children. For older children, the Rite of Christian Initiation for Children is the process for children over the age of 7 to prepare for Baptism, or to be welcomed into the Catholic Church. This process takes several months with regular gatherings, leading up to the Easter Vigil. For high school age and older,, the Rite of Christian Initiation of Adults (RCIA) is the process by which an adult receives the Sacraments of Initiation (including Baptism) and joins the Catholic faith. Please call the Parish Office for more information, 513-825-0618. 7:00 p.m.- the quarterly Baptism Workshop, held in the Church Gathering Space. If you are planning to have a child baptized, here is an opportunity to attend a workshop. Contact Becky and Paul Seibert or call the Parish Center Office at 513-825-0618. 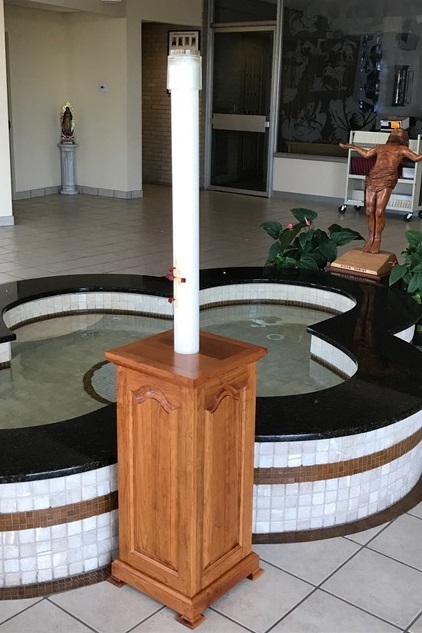 Sept. 2019 - TBD - the quarterly Baptism Workshop, held in the Church Gathering Space. If you are planning to have a child baptized, here is an opportunity to attend a workshop. Contact Becky and Paul Seibert or call the Parish Center Office at 513-825-0618.